To boldly go... The Magic Trek came to an end last Sunday, Sean Lobban reports: I’m pleased to say that we all finished The Magic Trek. Some of us had blisters, one of us had swollen sore legs and a couple just had a suntan! 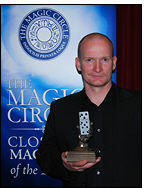 Six days, five magic clubs and 106 miles after starting we arrived at The Magic Circle Headquarters on Sunday 10th May. We were met there by friends, families and Acting President Jack Delvin, and Barbara and Alan Astra, who made everybody feel very welcome. At the end of each day we were met by members of each town’s club. Thank you to the members of The Associated Wizards of the South, Winchester Magical Society, The Magicians of Basingstoke, The Home Counties Magical Society and of course The Magic Circle who waited for us to arrive. 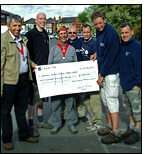 The attached photo is of Simon Williams, President of The Home Counties Magical Society, presenting a cheque from the club to The Trekkers. “Appearance, Reality and Truth in Magic”: British management and culture sage aladin has written an absorbing, beautifully written chapter about magic and conjuring, a seminal contribution to the academic literature, succinctly mapping this live art form, introducing theoretical discussions and benchmark definitions of the subject. A greatly admired magician in his own right, the author obliquely makes the argument for magic to be accorded its rightful place amongst the other performing arts and generally 'elevates' magic discourse. A quite brief but defining article, destined for inclusion in every reading list about ‘magic’. “There is an obsession with ‘appearance’ and ‘disappearance’ in popular discussions of magic [and also with] the techniques including technologies of ‘deception’ or ‘fabrication’. [This] focus on means is disproportionate and seems to imply that magic can be understood through knowledge of its techniques.